The best way to get to know a community is by scheduling a tour. See the facilities, meet the staff and residents, and get a feel first hand what it's like to live at Woodland Terrace Assisted Living. 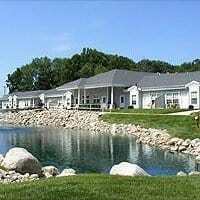 Woodland Terrace, a Christian Senior Living Residence, is located on twelve acres of dunes and woods in the pleasant rural community of Bridgman, Michigan, along the shores of Lake Michigan. Woodland Terrace, as a Senior Living Residence, provides Independent Living, Assisted Living, and Special Needs Residences. These residences were all designed with the idea of maintaining a home-like environment in a community setting. To avoid the difficulties associated with elevators, all of our residences are located on the ground floor. Residents needing 24 hour "on-site" licensed nursing personnel should seek the facilities of a skilled nursing home. However, there are 2 nurses and 1 nurse practitioner on the staff which provide around the clock nursing consultation services. Living in the independent apartments allows one to forget yard maintenance, housework, taxes, insurance, utility bills, transportation and just focus on Enjoying the Fine Art of Living. Our 24-hour staff is always available to make each resident's stay pleasant.